"Gritty district has its own breed of protester. Tough, streetwise, and kowtowing to no-one." Introduction to some differences between Mong Kok's more militant occupation from other sites of Hong Kong's predominantly pacifist and liberal "umbrella movement." Also includes a report on MK occupiers chasing police away yesterday morning. Note: We don't normally repost from mainstream media (since it's already widely accessible, for one), but this brief report (from South China Morning Post) provides as good an introduction as we could give to certain ways in which Mong Kok's more militant occupation differs from other sites of Hong Kong's complex but predominantly pacifist and liberal "umbrella movement." However, the article misses an important division among the Mong Kok occupiers - between what could roughly be called left and right factions (or perhaps left, right, and centrist factions) - which has developed from the dynamic already noted in Ultra's piece reposted here ten days ago, "Black vs. Yellow." We are translating an insider's account of this division to be posted here tomorrow.1 Below this we have also reposted a related brief report from SCMP: "Furious protesters chase police to Mong Kok station in nightly stand-off" (also from 12 October). No one was giving orders and communication was sporadic at best - but within hours of protesters being tear gassed beneath the shimmering towers of Admiralty two weeks ago a new front had opened in the fight for universal suffrage in an altogether different place. It was never supposed to be like this, but in remarkable times, remarkable things happen, and as Hong Kong Island took its first breath after that day of turmoil, the pounding heart of gritty, business-savvy Mong Kok was blocked by barricades at the intersection of Nathan Road and Argyle Street. It grew organically, as a few dozen citizens scrambled to move whatever objects they could find - from bus stop posts to rubbish bins and construction waste - to build barricades at either end of what is now a self-ruling protest site in the bustling district known for its coarseness and alternative culture. "We moved things around like ants, while others stood on the roof of nearby MTR exits, keeping look out for the police," said George Chu Ka Wun, who helped set up the Mong Kok protest site late on September 28, fuelled by indignation at the use of pepper spray and tear gas. "All along, nobody was taking the lead, we just instinctively knew what we should be doing." Thirteen days on, the site has evolved from just a few barricades to a fully furnished settlement with self-made marquees, tents, beds and religious shrines. Its occupants have faced hostility and violence from opponents and what they believe to be "defeatist" calls for retreat from movement organisers. With a hardline stance that has left them feeling alienated from events across Victoria Harbour, the mission has taken on a life of its own. Unlike the crowds on Hong Kong Island, this mixture of students, grass-roots underdogs, self-styled rebels and occasional white-collar workers are transforming the site into a highly adaptive and resilient ecosystem. But one thing has not changed. They refuse to be led by anyone, even while in a fight that is ultimately about choosing a leader - just one not vetted by Beijing. "Originally, the purpose of setting up a site in Mong Kok was to help protect the students in Admiralty by stretching the police resources," said Chu, who was outside the government headquarters when the police tried to disperse the swelling crowd with pepper spray and tear gas on September 28. 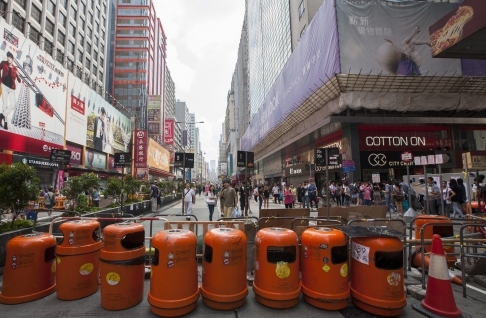 Interconnected by a maze of narrow streets and major arteries like Nathan Road, densely populated Mong Kok provided an ideal setting: "We felt it would be harder for the police to use excessive forces on us here," Chu said. Usually packed with mainland tourists and local shoppers, this is the sort of place Chu, a 34-year-old father of one and an accounting officer, would avoid during a day off. But since helping to set up barricades on September 28, Chu has come back almost every day, even when pressed with assignment deadlines for his part-time bachelor's degree in law. "This place is so different from other protest sites. It is independent of all organisations and political parties. It has many enemies, but it has the touch of heartiness you don't find in other places," Chu said. Since the site's inception, Chu and other protesters say they have not affiliated with organisers of the student protests and the Occupy Central movement. Many in the Mong Kok crowd support neither Occupy Central nor the student strikes. "We want true universal suffrage, but we think it's pointless to negotiate with the government. And the Occupy Central leaders had been talking about occupying for so long that you just thought it was never going to happen," Chu said. Yet, they felt compelled to come out and support the students when the police used force to disperse them. But now many said they were let down by organisers and various pro-democracy political parties repeatedly calling for protesters to retreat. Some of the retreat messages were directed at the Mong Kok site from the beginning, they said. "They put out various reasons, some said it's too dangerous here, some said we were thinning the Admiralty crowd and should fold our operation here to join them. But nobody listens to them, we believe this site's existence makes it difficult for the police to suppress the whole movement," said a 34-year-old IT technician who would only give his surname as Fan. Chu said some major decisions were made by majority votes but for the most part hierarchy appears to be non-existent here. Anyone with an amplifier can speak anywhere within the zone, sometimes debates ensue, sometimes arguments develop with citizens. Pro-democracy protesters (left) face an anti-Occupy Central crowd (right) on day six of the Occupy Central mass civil disobedience campaign. Last Friday and Saturday, the Mong Kok protesters faced the most daunting challenge yet as a mob attacked them and tore down their tents. Protesters, journalists and police officers were injured. Protesters claimed the violence was organised and police presence was meagre. Police said some of 19 people arrested were linked to triads but refuted accusations that they were colluding with the thugs. Don, a 27-year-old man who declined to give his full name, was among those who locked arms to form a chain to protect the more vulnerable protesters last week. A week on and, although the crowd has thinned, tents have been rebuilt. Protest slogans have been plastered back on the walls. Many carry a simple message: "Never retreat". Don said the site had grown more resilient, largely thanks to the "Mong Kok spirit" and the lanzai - a word that translates literally from Cantonese as "rotten guy" and describes a punkish sense of defiance, not defined through violence but prepared to fight back hard when necessary. Mong Kok is a labyrinth of triad-run businesses, intertwined with small shops ranging from the trendy to the tacky. "The lanzai have to be flexible, adaptive and quick-thinking in order to survive in this kind of hostile environment," said Don, sitting with friends that make bold fashion statements, epitomising the gritty nature of the district - tattoos, long hair and piercings. "The barricades here have been removed, rebuilt and reinforced multiple times. Some people even placed a shrine of Guan Gong [a god that both the triads and police pray to] here." Chu, the accounting officer, agreed that the coarse "MK Guys" - an often derogatory term describing low-educated, tough-living denizens of Mong Kok - played significant roles in building the site. "I was just impressed at how united and determined they could be even in the absence of any leadership," he said. Don and some friends are in a 100-strong team that take turns to patrol the site. "We mainly keep watch for suspicious people, especially after what happened last Friday. If we find someone that we believe is instigating a fight, we will separate them from the crowd and prevent a brawl," he said. "We don't really have enough people, but we are wary of expanding because it's hard to prevent infiltration." A high-school dropout, Don said he received little support from his teachers, who regarded him as an underachiever. "So I think it's very important to give the students a chance, even though I do not want them to lead me," he said. Like many protesters in Mong Kok, Don, Chu and Fan all said they would not retreat without achieving what they had set out for - a withdrawal of the National People's Congress's proposed electoral reform that would allow only Beijing-vetted candidates to run in chief executive elections. "In Mong Kok, we are having a hooligan-style fight. We get back up after being beaten down. We don't have leaders, so we rely on our instincts, while in Admiralty they are still wondering whether to punch with their fist or kick with their foot," Don said. "Furious protesters chase police to Mong Kok station in nightly stand-off"
A series of angry stand-offs between police and protesters in Mong Kok during the early hours of yesterday ended an otherwise largely peaceful second week of democracy sit-ins in the bustling Kowloon neighbourhood. At least three people were arrested. A man who identified himself as a citizen journalist was hit by a police baton and lost consciousness temporarily, while a reporter from the Ming Pao newspaper claimed to have been kicked by police and sustained a bruise to his leg. Police have yet to comment on the predawn happenings. Protester James Cheung, who regularly helped to clean the Mong Kok protest site, said: "This place is often messy, but it will not deter me from staying here." The stand-offs began at about 2am when plain-clothes police officers requested identity cards from demonstrators at an occupied section of Nathan Road, where the group had been reinforcing their protest barricades. The group asked the officers in return to show their proof of identity. A heated argument ensued. The police began retreating from the scene, escorting one protester to Sai Yeung Choi Street South. But the protesters followed them to the side street, where another conflict broke out. At least two people were escorted away. In the melee, 28-year-old James Bang, who claimed to be a citizen journalist, was hit on his knee and arm, while a female protester, 15, accused an officer of molesting her. Both were taken to Kwong Wah Hospital in an ambulance. The girl later decided to drop her allegation although she was adamant that the officer had put his hand on her chest. Wong Yin-kong, a regular protester in Mong Kok, said he recognised the girl. "I think she is a volunteer here; I have seen her around helping out," he said. Protesters kept up their pursuit of police officers and were finally confronted on Argyle Street at 3am. The near hour-long quarrel ended with police escorting more protesters away and holding up the now-familiar yellow banner warning people not to breach police cordons. The officers retreated further to Mong Kok police station to shouts of insults from protesters, and closed the station's gate as the crowd approached. Wong said he did not recognise that group of protesters. "It seemed they appeared suddenly and had not been hanging out around here," he said. The Lexus seen after the driver's arrest. Photo: Peter SoYet more action took place outside the police station when a white Lexus rammed into a taxi at Prince Edward Road West. Protesters surrounded the Lexus to prevent the driver from fleeing and pounded on its windows. Police eventually smashed the car's windows to arrest him. A police officer later said the man was suspected to be driving under the influence of drugs. Including the driver, three men aged 23 to 32 were arrested. As the day wore on, tempers briefly flared again when Federation of Students representatives arrived in the afternoon to offer help and gather views on how they could sustain the movement. But they were blocked from entering the protest area by "native" Mong Kok protesters accusing them of trying to hijack the leaderless movement. Many accused the students' group of trying to "plant their flag" and to make decisions on their behalf, including concessions with the government. Federation secretary general Alex Chow Yong-kang called for greater understanding. "We are all Hongkongers living in the same city, striving for the common goal of democracy, freedom and justice," he said. 1. Another reason to repost this here is the SCMP tends to put their articles behind a pay-wall after a few days. If possible, go to SCMP for photos, links, and a video. In Mong Kok, we are having a hooligan-style fight. We get back up after being beaten down. We don't have leaders, so we rely on our instincts..